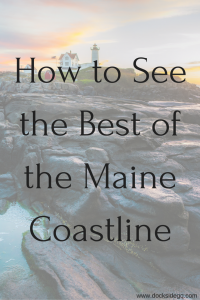 With more coastline than California, viewing the Maine coastline takes a lot of time. Touring the coast is a long, but beautiful journey spanning nearly 3,500 miles. Maine is larger than the other 5 New England states combined leaving much to be explored. With the vast journey, it is widely recommended to view the Maine coastline in sections and staying in different towns along the way. Our favorite part of the Maine coastline is the beautiful Southern Maine Coast Region, consisting of the first 30 miles. Here you will find a multitude of towns with beautiful oceanic views. Starting from the southernmost point, Kittery, Maine, is the first town you arrive in when driving north from New Hampshire. As the first incorporated town in Maine, Kittery has a rich history dating back to 1623. First established as a fishery town, Kittery encompasses Badger Island and the Isle of Shoals. There is plenty to do in Kittery and it is often referred to as a great shopping town. For the best view of the coastline from Kittery, we recommend driving from New Hampshire over the Piscataqua River into Maine where the stunning coast welcomes you. Like Kittery, York, Maine, has a lot of history to offer. As one of the nation’s oldest cities, you’ll find historic treasures throughout this quaint little town. Whether you take a trip to York Beach, visit York Harbor, or stop by Cape Neddick you will definitely enjoy everything York has to offer. For the best view of the coastline from York, we recommend driving along the scene Rt 1A. Ogunquit means “Beautiful Place by the Sea” by the Algonquin Indians. While travelling through this village make sure to stop by Perkin’s Cove and check out all of the wonderful little shops and restaurants. For the best view of the coastline from Ogunquit, we recommend walking along the drawbridge or visiting the 3-mile stretch of near perfect beach sand. Home to the most antique stores in Maine, Wells offers beautiful beaches, great seafood, and much more. For the best view of the coastline from Wells we recommend travelling along Route 1. Kennebunk and Kennebunkport are two villages which are known for their popular summer residents, President and First Lady George and Barbara Bush. For the best view of the coastline from Kennebunk and Kennebunkport, we recommend a drive down Ocean Avenue. While Saco, Maine, is slightly more inland than the other towns in the Southern Maine Coast region, this area is well-known for its amusement parks, Funtown and Splashtown. For the best view of the coastline from Saco, we recommend a short drive down Seaside Avenue. Finally, at the northernmost part of the Southern Maine Coast region, we find ourselves at Old Orchard Beach, Maine. Known as “Maine’s Premier Family Beach Resort,” Old Orchard Beach will entice you with its 7-mile stretch of beach and seaside amusement park, Palace Playland. While you can’t explore the entire Maine coastline in one go, starting with the Southern Maine Coast Region is a beautiful place to be. While spending your time here book at stay here at Dockside Guest Quarters. We look forward to hosting you and hearing all about your beautiful Maine coastline adventures.